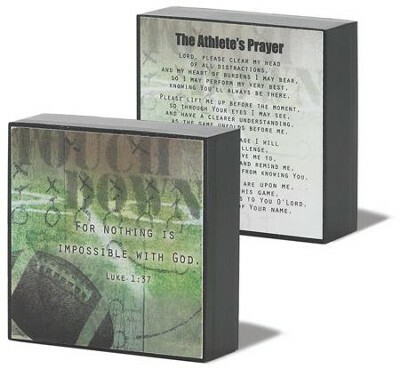 Sports block for athletes is just the right size for desk or dresser, featuring Scripture verse and football graphic art, and on the reverse side, The Athlete's Prayer. 3" x 3" x 1", top gift pick for teens and teams. I'm the author/artist and I want to review Athlete Prayer Football Plaque.